"The fact is, college has never been more necessary, but it's also never been more expensive." The cost of college tuition has been in the headlines frequently in recent years. Conventional wisdom says the cost of a college education is rising—but is it really? The "sticker price" for a college education has risen three times faster than the inflation rate since 1978. However, when we adjust for inflation, expressing the cost in terms of constant dollars, and account for financial aid (which reduces the overall cost), average tuition and fees have remained effectively unchanged. For example, the College Board reports that average tuition and fees increased from $24,070 for the 2003-04 school year to $30,090 in 2013-14, but the average net tuition and fees (after financial aid) actually decreased from $13,600 per year to an estimated $12,460—a reduction of $1,140 over 10 years (in 2013 dollars).2 Why the difference? The textbook explanation falls under the heading "price discrimination." Price discrimination is the practice of selling the same good or service at different prices to different customers. It occurs in imperfectly competitive markets3 when producers sell their product to buyers at a price that reflects their willingness to pay. For example, if you owned a business, you would likely prefer to sell your goods to each individual buyer for the highest price each buyer would be willing to pay. Unfortunately, this would require you to read consumers' minds and see inside their wallets. In the case of price discrimination, sellers infer consumers' willingness to pay a certain price by other means. A simple example of price discrimination is the price of seeing a movie. At the theater ticket counter, you might notice that different groups of people (seniors and students) pay different prices. Why? Theaters realize that seniors and students (on average) have less disposable income and are likely to be very price conscious. As a result, they may choose not to see a movie at the full price. Offering a lower price to these groups gives theater owners the benefit of charging some moviegoers the higher (sticker) price without excluding less-affluent consumers, thereby filling theater seats that might otherwise be left empty. Of course, seniors and students benefit by seeing a movie they might not otherwise see. Sellers who price discriminate must overcome a few obstacles. First, sellers do not know how much each buyer is willing to pay, so they must find a way to infer this information. For our movie example, sellers (the theater owners) infer willingness to pay through age demographics and student status. Second, sellers need to establish a method that prevents all consumers from paying the lower price. Movie theater owners might ask seniors and students to present identification to verify their age or student status. Finally, sellers must be able to prevent arbitrage, which means they must prevent consumers who buy an item at a lower price from reselling it at a higher price. Because moviegoers pay the ticket price as they enter the theater, movie tickets cannot be easily resold to other moviegoers. How Do Colleges Practice Price Discrimination? The price of tuition is clearly published on the website of nearly every college, but individual students often pay very different prices at the same institution. Colleges price discriminate by means of financial aid, which allows the college to subsidize the cost of college, essentially offering a discounted price to students who are less able or unable to pay full tuition. Colleges can infer willingness to pay from the detailed financial aid documents filed by families in the college application process. And because each financial aid package is individualized, the college can ensure that all students do not pay the lower price. Further, because students cannot resell their college education, there is no risk of arbitrage. In fact, for many students, earning a degree from one of the world's finest universities might be less costly than a degree from their local state college. In 2012, financial aid recipients at Harvard University paid an average of $12,000 toward tuition, room, board, and fees—receiving $41,000 in grants—and families earning less than $65,000 per year paid zero.4 Of course, gaining admission to Harvard is very difficult; only 6 percent of applicants were accepted in 2012. SOURCE: Baum, Sandy and Ma, Jennifer. 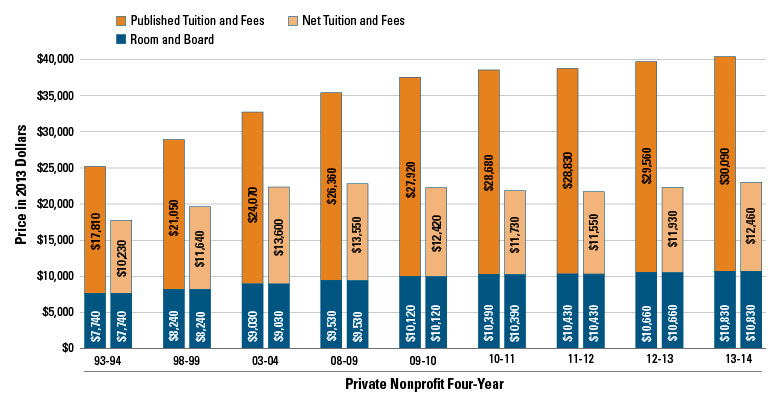 Trends in College Pricing 2013. New York: The College Board, p. 21. ©2013 The College Board; http://www.collegeboard.org. Price discrimination allows colleges to charge many different prices for essentially the same service. This practice benefits students from low-income families. But, there is no free lunch: The cost burden has become increasingly progressive as wealthier families are paying more for education and subsidizing needier students. What's the lesson for prospective students? Select the school of your choice and apply for financial aid; your net price might be lower than you expected. 2 In this calculation, inflation is measured by the consumer price index and tuition figures are the published prices of private institutions. See Baum, Sandy and Ma, Jennifer. Trends in College Pricing 2013. New York: The College Board, 2013; http://trends.collegeboard.org/college-pricing/fig.... Financial aid data for 2013-14 are not yet available, so we use preliminary estimates here. 3 Price discrimination is possible only in imperfectly competitive markets, which are markets where sellers have some control over the market price of the product. This is not possible in perfectly competitive markets where there are many buyers and sellers and no individual seller is large enough to influence the market price; these firms sell their products at the price determined in the broader market. 5 Stein, Herbert. What I Think: Essays on Economics, Politics, & Life. Washington, DC: AEI Press, 1998, p. 32. Arbitrage: The simultaneous purchase and sale of a good in order to profit from a difference in price. Price discrimination: The practice of selling the same good or service at different prices to different customers. Willingness to pay: The maximum amount that a buyer will pay for a good or service.